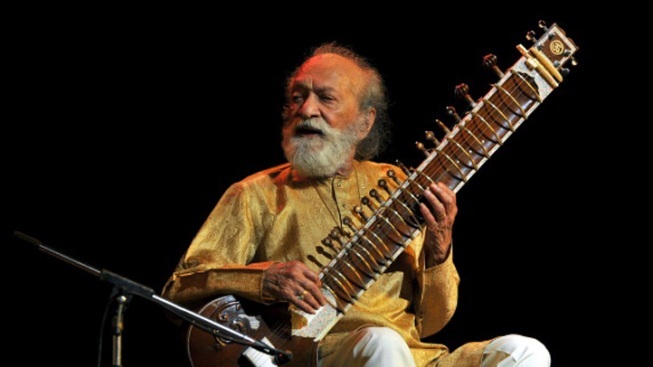 The Indian sitar master bridged cultures to become a music legend in the East and West. Renown Indian Sitar maestro, Pandit Ravi Shankar plays during the "Premaanjali Festival 2012." Ravi Shankar became the most unlikely of Western pop stars: a middle-aged master of the sitar largely unknown outside South Asia who suddenly found himself hanging out with the biggest rock acts of the 1960s and playing at the likes of the Monterrey Pop and Woodstock music festivals. But the Indian musician, who died Tuesday at age 92, was far more than a fleeting 1960s hippy-dippy fad or just George Harrison's pal or Norah Jones' estranged dad. Ravi Shankar, in his own gentle way, shook and melded the worlds of Eastern and Western music, forging a legacy whose influence resounds long after his final note. His death, which came on the eve of the 12/12/12 show to benefit victims of Hurricane Sandy, served as a reminder of perhaps his greatest achievement: organizing, with Harrison, the 1971 Concert for Bangladesh. The spectacle, four decades ago at Madison Square Garden, gave popular music a sense of power, responsibility and, most significantly, an expanded worldview. Perhaps the biggest name among the superstars playing Wednesday's Garden gig is Paul McCartney, who, with John Lennon, Ringo Starr and Harrison unleashed the wave of the pop music experimentation that gave us early tastes of what some called raga rock. Harrison, who first picked up a sitar while filming a scene in an Indian restaurant during the movie "Help!," started by putting a distinctive sitar line in the Beatles' "Norwegian Wood (This Bird has Flown)" in 1965. The Rolling Stones followed by memorably incorporating the instrument into the pounding "Paint it, Black." But Harrison delved deeper, seeking out Shankar, already a top musician in his homeland, as a teacher. That led to "Love to You" on the "Revolver" album, as well as "The Inner Light," an ethereal, underrated Harrison composition that graced the B-side of "Lady Madonna." Shankar's touch, though, can be felt most deeply on the winding and weaving "Within You Without You," from the Beatles' landmark "Sgt. Pepper's Lonely Heart Club Band" album. While the Beatles were inspired by a long line of musicians growing up – Elvis Presley, Chuck Berry, Buddy Holly, to name a few – Shankar and Bob Dylan were among their few contemporary influences. The Beatles' penchant for innovation sparked more pop musicians to expand their musical palettes – the results range from Led Zeppelin's "Kashmir" to Paul Simon's "Graceland" to the hip-hop ethos of genre-bending sampling. Shankar, whom Harrison dubbed the "godfather of world music," lived long enough to see musical boundaries dissipate, thanks to adventurous artists around the globe and an online, iTunes-driven era in which songs from all over can be summoned with a click. Shankar tributes, at least on this side of the globe, are destined to stress his Beatle ties and assess him in Western terms. We're guilty on that account. But suspect that he'd be okay with accolades from all viewpoints. Ravi Shankar, perhaps better than any performer of the mass media age, recognized the power and value of popular music of all kinds, and died secure as a world legend.